Highly recommended to all customers! Now with £160 discount when purchased along with a machine (configure as a machine option). 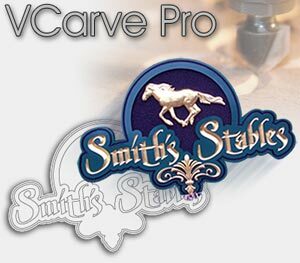 VCarve Pro is a complete solution For CNC routing, sign making, woodcarving and engraving. As well as world class V-Carving strategies, VCarve Pro offers all the tools you need for 2D CNC machining as well. Features such as True Shape Nesting, Raised Prism machining, Auto-Inlays, Wrapped Rotary 4 axis machining user definable Tabs / Bridges, Ramping, Lead in / out, automated tools for identifying open and duplicate vectors, an advanced toolpath simulation engine and many more, have all been designed to enable you to work more quickly and efficiently. One of the most important productivity tools available in VCarve Pro is the realistic 3D toolpath preview support. The results of all toolpaths can be previewed cutting into a 3D model. This means that whether your job is a simple toolpath with one tool, or created from a complex combination of tools and strategies at different levels you can be sure that when the job is cut, it is right first time. As well as showing that the toolpaths are correct, the high quality rendering and ability to use real world material textures and fill colors is a very valuable sales tool. Using the simulation you can create customer proofs and evaluate design options without actually having to cut anything! V-Carving uses a constant angled cutter that is moved at flowing variable depth to create a 3D carved effect on the job, similar to the way a craftsman would work by hand. The extremely fast and robust VCarving engine within VCarve Pro handles complex designs with ease. Complicated designs that many other CAM programs choke on, often requiring the design to be cut in sections, or that can take more than 15 minutes to calculate are typically handled by VCarve Pro in one go, in seconds! As well as the fast calculation speed and robust handling of data, we have been told by many of our users that the resulting toolpaths run much smoother than those calculated by their previous program - programs that often cost in excess of £3000. As well as simple VCarving, VCarve Pro supports many advanced VCarving strategies, such as Flat Bottomed v-carving, optionally using a second flat bottom tool to optimally clear out the flat areas. Another advanced capability is the support for v-carving areas wider than the tool by making multiple clearance passes to achieve the required depth. Import designs from PhotoVCarve PhotoVCarve designs can now be incorporated into into V-Carved projects to make more interesting products. 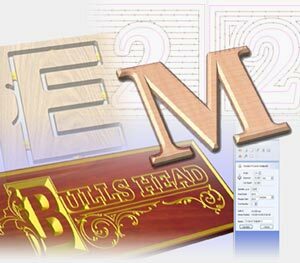 It is now very easy to add decorative carved borders and text to PhotoVCarve projects, enhancing their attractiveness and value.